Watch out Tesla, Fisker, and Mercedes-Benz. 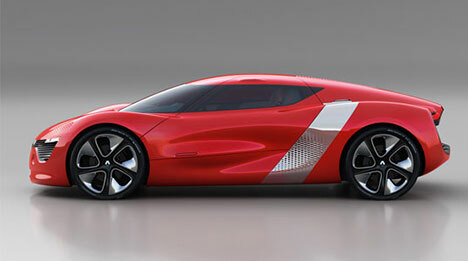 French automaker Renault is angling for a share of the luxury electric vehicle market with the DeZir coupe, an electric two-seater concept car with a Kevlar body and tubular steel frame. The vehicle, set to make its official debut at the Paris auto show in October, has a top speed of 112 mph, and a range of 100 miles. DeZir also has 150 horsepower, and 167 lb-ft of torque–not all that impressive, but the lightweight vehicle can zoom to 62mph in 5.0 sec. And while the driver can’t go very far, the vehicle can be recharged to 80% of full charge in 20 minutes with Renault’s Quick Drop charging technology. Like the Nissan LEAF and the rest of EVs produced as part of the Renault-Nissan partnership, the DeZir offers a mid-mounted 24kW/h lithium-ion battery and electric motor. 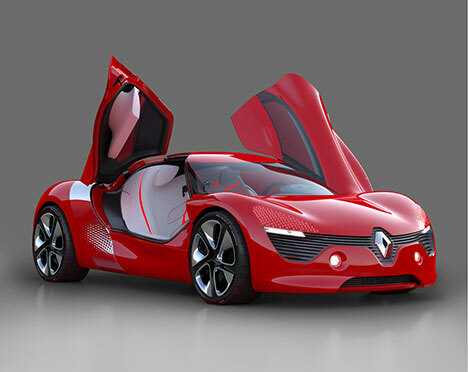 Renault does have a number of EVs that will be released in the near future, however. The 2011 Fluence ZE will be the first production-ready vehicle that uses Better Place’s battery swap system. The Kangoo ZE electric van will also be released in 2011. And by the end of 2013, the Renault-Nissan alliance hopes to produce 500,000 EVs globally. The DeZir is, in other words, at least a hint of things to come.